I Guess I’m Not a Very Good Christian . . .Do you feel like:I don’t pray enoughI don’t read my Bible enoughI don’t share my faith enoughI don’t love God enoughI’m not committed enoughI’m not spiritual enoughThen this book is for you. Messy Spirituality was written for the silent majority of us who have been convinced that we just don’t do Christianity right. We spend most of our lives worried about what we don’t do instead of what we have done, focused on our imperfections instead of God’s fondness for the imperfect. Why? Because we’ve been bombarded with books, tapes, talks, seminars, and movies convincing us that real Christianity is all about perfection.Michael Yaconelli dares to suggest that imperfection, infiniteness, and messiness are, in fact, the earmarks of true Christianity; that real Christianity is messy, erratic, lopsided . . . and gloriously liberating. What if genuine faith begins with admitting we will never have our act completely together? Maybe messy disciples are exactly the kind of imperfect people Jesus came to earth for and whose company he actually enjoyed--and still enjoys. If you want to find Jesus today, look for him in the midst of burned-out believers, moral misfits, religious incompetents . . . men and women whose lives are, well, messy. 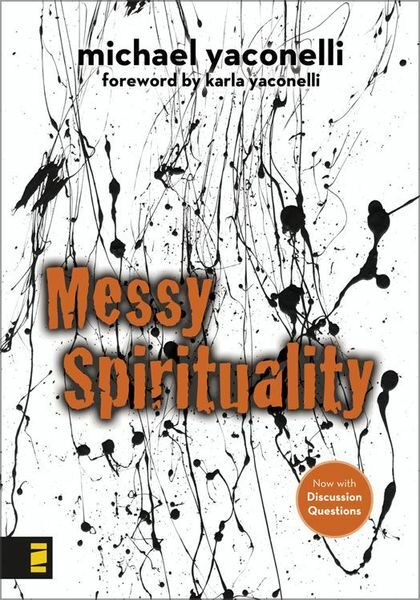 Messy Spirituality is a strong antidote for the spiritual perfectionism in us all. Here are truths that can cut you loose from the tyranny of ought-to’s and open your eyes to the deep spirituality of being loved, shortcomings and all, by the God who meets you and transforms you in the midst of a messy and unpredictable life.